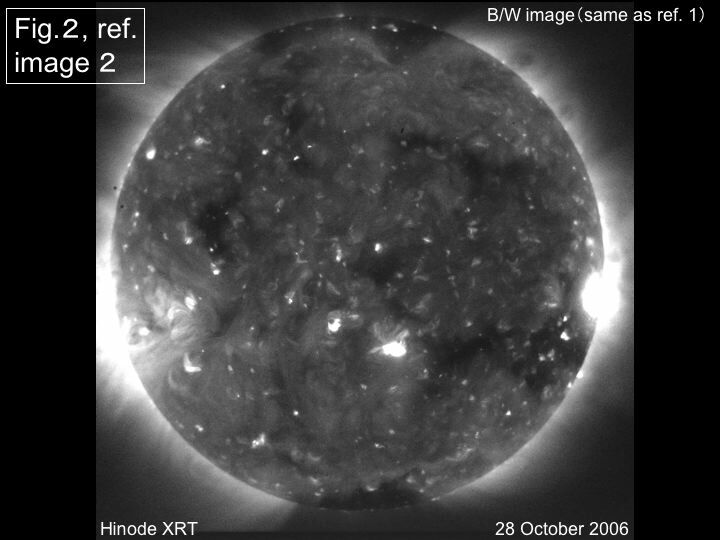 The sun-observing Hinode satellite (formerly Solar-B) of the Japan Aerospace Exploration Agency (JAXA) was launched from the Uchinoura Space Center, Kagoshima Prefecture, Kyushu, Japan, on September 22, 2006 at 21:36 GMT, aboard the seventh in JAXA’s series of M-V rockets. For two weeks the satellite carried out orbit adjustments, and is now in a sun-synchronous orbit, which allows it to observe the sun for uninterrupted periods lasting months at a time. Hinode contains three instruments dedicated to observing the sun: the Solar Optical Telescope (SOT), the X-Ray Telescope (XRT), and the EUV Imaging Spectrometer (EIS). Each of the instruments have now opened their protective doors and successfully commenced test observations. 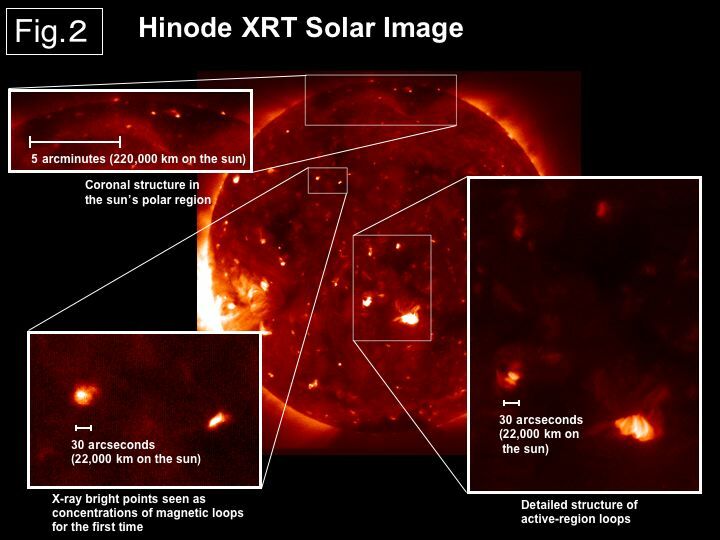 Currently, Hinode’s power systems and attitude pointing are stable. For approximately the next month, activities will progress from testing the basic operational aspects of the telescopes, to implementing the scientific operation mode. During this period, from time to time we plan to release images and telescope-performance information on the homepage for each instrument, or through other sources. We expect to complete adjustments of the instruments and enter the scientific observation phase of the mission early in December 2006. At that time we intend to release a summary of initial scientific findings obtained from the test images. 1) SOT opened its front door on October 25, and immediately began taking engineering test images and performing focus adjustments. Attachment 1 shows an image taken during this testing phase with SOT’s broadband filter. From this and similar images we have confirmed that SOT is achieving very high spatial resolution of 0.2 arcseconds, a primary objective of the instrument. 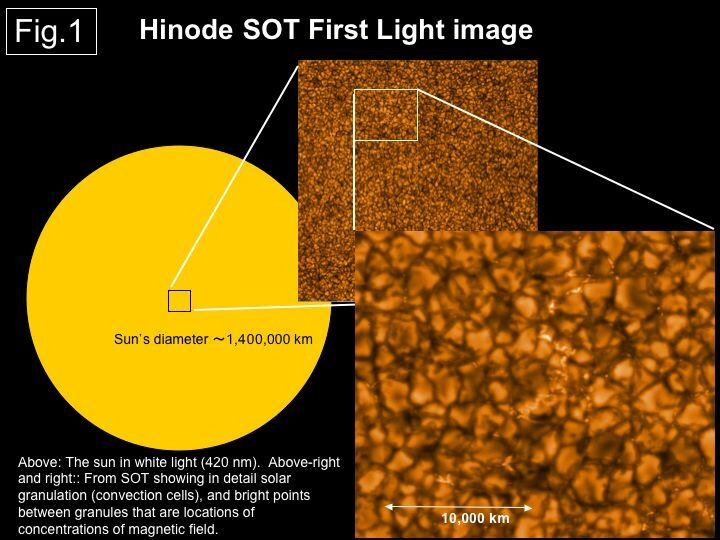 We also have determined that the spectropolarimeter, SOT’s primary instrument for detailed measurements of the solar magnetic field, is exceeding its expected levels of performance. Currently, however, proper performance of SOT’s narrowband filter is limited to only a portion of the filter’s field of view. 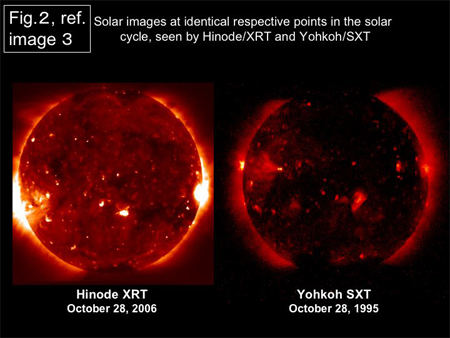 The SOT instrument team is investigating measures to overcome this issue. 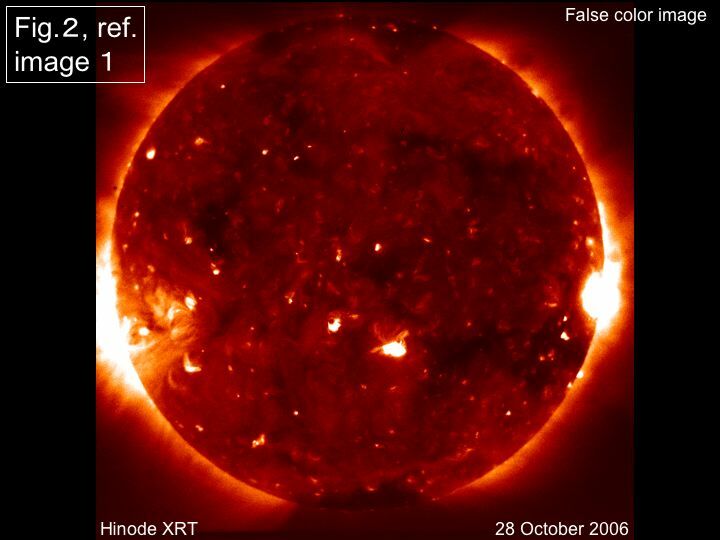 2) Shortly after launch, XRT experienced unexpectedly high temperatures near the front of the telescope tube. This resulted in its front door opening earlier than expected. Nonetheless, it successfully commenced taking high quality test images on October 23, and has been performing well ever since (attachment 2). We have verified that the telescope is meeting its expected level of performance, and the test images show that its observing capabilities exceed those of the highly successful soft X-ray telescope of the Yohkoh satellite, with spatial resolution reaching nearly 1 arcsecond. 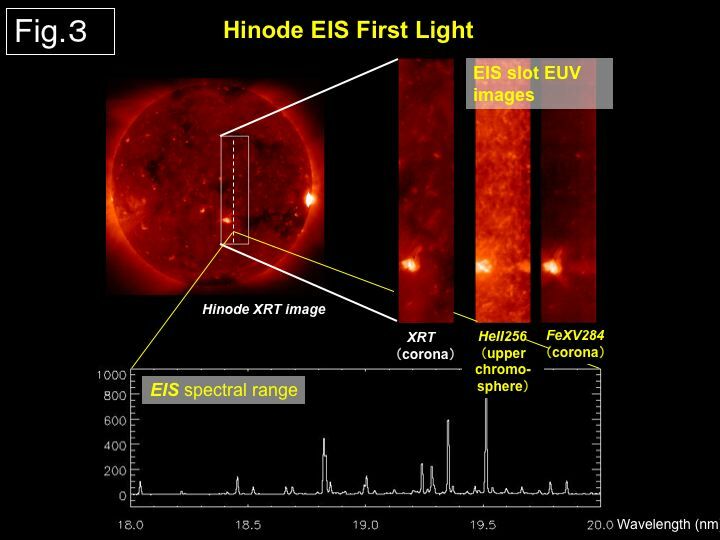 3) EIS opened its door on October 28 and immediately began taking “spectroscopic imaging” data, allowing us to verify that it is operating properly. 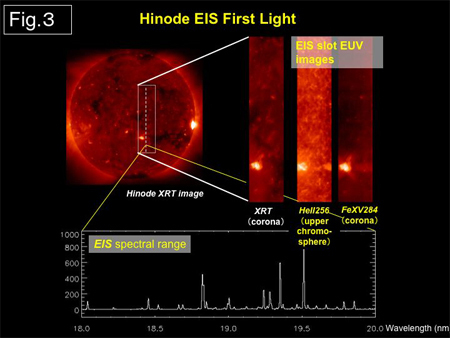 This instrument takes spectroscopic images using either a spectroscopic slit or a wider “slot.” Data from EIS consist of mixed positional and wavelength information. We plan to release more complete test images after completing the analysis needed to extract the imaging information from the raw data. A preliminary spectral image is shown in attachment 3.